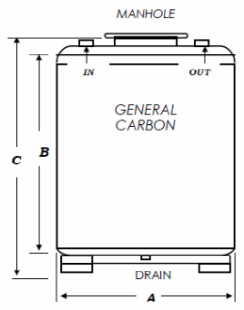 Activated Carbon Filtration | TL-Series | General Carbon Corp. The Transportable Liquid Phase adsorbers are fabricated from mild steel and are tested to DOT shipping standards. All units have two part Epoxy coatings on the inside and industrial enamel on the outside to give a long service life. 2″ steel FPT inlet/outlet fittings on the top of the vessels are connected to PVC internals for corrosion resistance. The units have 4-way forklift access, a screened drain and 16-inch top manhole. GC 8×30 virgin, bituminous coal base activated carbon is standard with GC 12×40, reactivated GC 8x30R and other specialty carbons available. Recharging – Once the activated carbon is saturated by contaminants, the unit should be taken off line. If connected in a series mode, the next downstream unit should be moved into the lead position and a fresh unit put at the end of the train. To purchase replacement carbon or to arrange for a carbon change-out, please contact our office. When preparing the unit for servicing, as much water as possible should be drained from the vessel through the screened drain fitting. All shipping plugs must be replaced when the unit is to be transported.